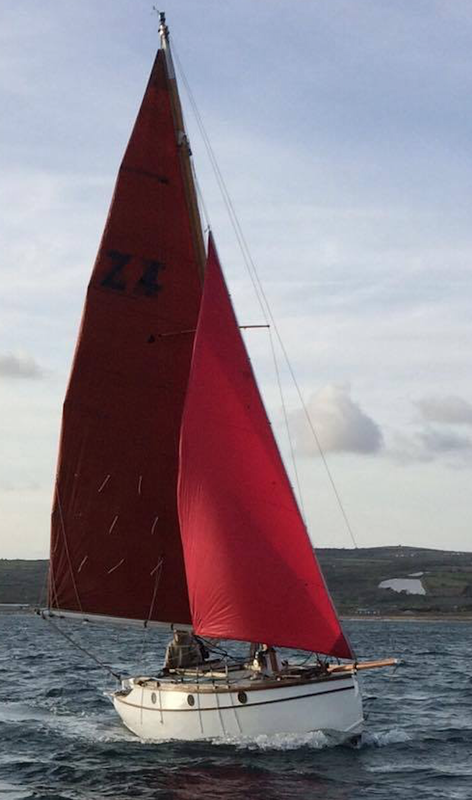 Zephon zipping along under full sail off the Cornish coast earlier this year. She was built in 1950 in Swansea to Harrison Butler's Zyklon design. A newspaper or magazine masthead is the publication's title displayed on the front page. So, for example, the Albert Strange Association's periodical is The Jib & Mizzen, and that of the Hillyard Owner's Association, The Hillyarder. A quirk of the old Harrison Butler Association Journals is that they have no masthead. After considerable thought I took the decision to title our quarterly publication, CRUISING YACHTS : By the Surgeon's Eye. There is an interesting dynamic between wanting a name that isn't vague but also not so specific that it ends up being limiting. It's an issue that is very difficult to resolve. Without wanting to be unkind, The Jib & Mizzen is too general a title for a publication focussing on Albert Strange designed boats. On the other hand, the Old Gaffers Association has run into the too limiting problem. It ignores the implication of it's publication The Gaffers Log is exclusively about boats that are Gaff rigged; Bermudan rigged boats are made equally welcome. 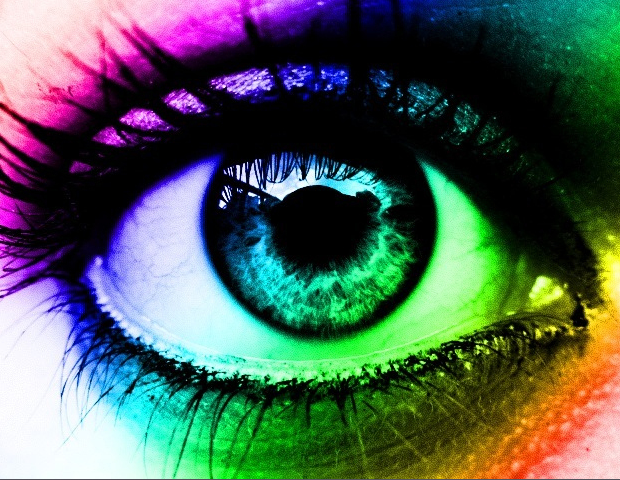 To be inclusive is good for it's become one of the premier champions of the delights of sailing a wooden boat but, to put it in a nutshell, it's not what it says on the tin. More generally, when naming a product, it's unwise to ignore the various other interpretations invoked. Even professional companies can get this wrong. For example, I was amused recently to drive behind a car manufactured by Dacia and branded Duster. Clearly the intention is to conjure up images of dusty off-track terrain with which this machine will cope. However it would take a banter immune person to drive a bright yellow Duster. To me, The Jib & Mizzen could be the name of a pub, and Old Gaffers has the unwanted implication that the young are not catered for because gaffer is slang for “old man”. Some publications go for a fun play of words. I have in mind the fact that the Hillyard Owners' Association call their biannual magazine The Hillyarder; an amusing play on designer David Hillyard's name. In the world of Google searches, having a unique invented word has merit. I considered The Harrison Butlerians but ended up rejecting it because, although it would do the job, it lacks depth. There is no extra dimension. The more I thought about it, the more I wanted the HBA Journal's masthead to tap into something specific about Harrison Butler. 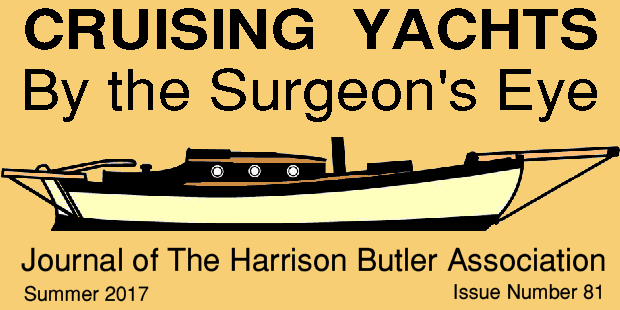 I first alighted upon By the Surgeon's Eye because it rather neatly referenced the fact that Harrison Butler was an ophthalmic surgeon, and I really liked the implication that surgical precision and care was applied to the boats he designed. Alas, on it's own it lacked any nautical connotation. I'd separately been thinking about how all the mainstream publications go for quite broad titles such as Classic Boat, Classic Sailor, Yachting Monthly, Yachting world, and Sailing Today. It occurred to me that no publication is called Crusing Yachts, half the title of Harrison Butler's book Cruising Yachts : Design and Performance. On it's own, Crusing Yachts was hopelessly vauge. I was so pleased when I realised that when used in combination with By the Surgeon's Eye I had finally arrived at a title that was specific without being limiting, and which had a bit of depth and meaning behind it. !•¡•! It's not just the housing market that has slowed down recently. Several boats have remained on the market that, in more certain times, would have sold by now. The result is some spectacular price reductions: Caracole £15,000 => £10,950, Jolanda £28,400=> £14,400, and Watermaiden £15950 => £13,000. See our Boats for sale section for further detail. !•¡•! Tally Ho, the Albert Strange designed boat which won the 1927 Fastnet race, and which was about to be cut up, has been saved. A new owner has come forward and a plan is in place to patch her up sufficiently to bring her back to the UK for proper restoration. The story of her remarkable salvation is to feature in the August/September Classic Sailor. !•¡•! The Hillyard Owner's Association is to consider at their next AGM John-Henry's proposal to set up a fund to promote building and maintaining wooden boats. 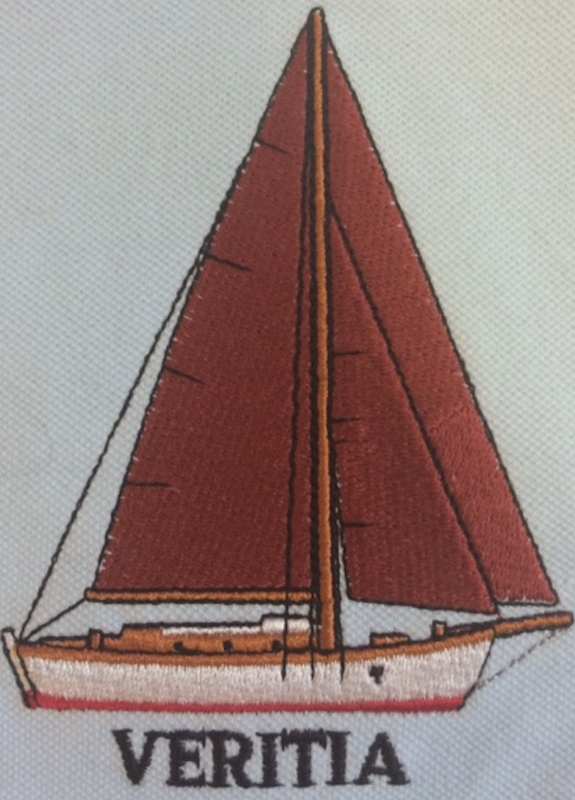 The Nancy Blackett Trust have also stepped forward. !•¡•! The June 2017 issue of Classic Boat features “one family's experience of the Round the Island Race on a 26 ft Harrison Butler yacht”. 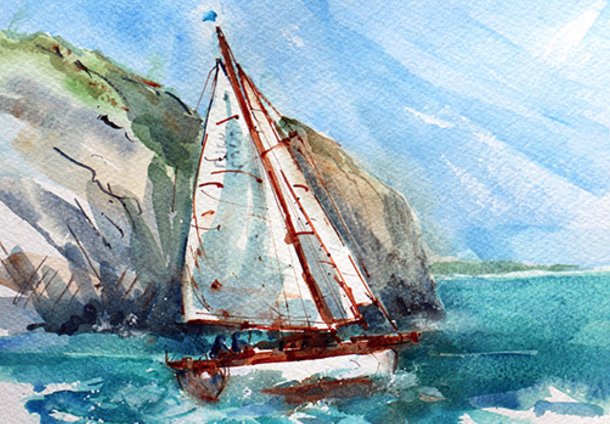 Spread over six pages and illustrated with several delightful watercolours by Sue Peake. The article is an absolute show-stopper. That seemingly familiar yacht was Yoldia, the elder sister of Harrison Butler's own yacht, Vindilis. The reason why Vindilis was fitted with a Bermudian rig instead of its intended gaff rig is that the doctor to whom Yoldia belonged, Emil Ehnroth, had given Yoldia an experimental Bermudian rig. Emil Ehnroth, like Harrison Butler, was an ophthalmologist. Emil enthusiastically shared with Harrison Butler his positive experience of the Bermudian rig. After the war, Ehnroth joined the County Hospital of Gävle, Sweden, a town 110 miles north of Stockholm. This is where my father worked. In 1949, Ehnroth needed money to pay for the printing of his daughter's doctoral thesis. However, his economic resources remained in war torn Finland, burdened by severe war indemnity payments to the Soviet Union. The Finnish Government had instituted export restrictions, and transferring money out of Finland was difficult, almost impossible. So, Ehnroth could not liquidate any assets in Finland to transfer the money to Sweden, nor export any of those assets. He decided to smuggle Yoldia out. When you smuggle a 5.5 ton yacht out of a country, you sail it, of course. The problem with this plan was that, as a well-known sailor, Ehnroth's presence on board Yoldia and in waters adjacent to Swedish territorial waters, without any legal papers declaring his right to be there, would raise questions about why he was there. It would be difficult to give credible answers to such questions. The penalty would be the confiscation of Yoldia. The solution was that Ehnroth's daughter would do the smuggling. If she were caught out by Finnish Customs in those waters, she would claim to be lost. In those days, when ladies were not expected to sail a yacht of Yoldia's size across the Sea of Åland (about one day's sailing), she had a sporting chance of being believed when expressing her gratitude for Customs arriving to tell her where she was. The plan was successfully implemented and Yoldia was duly sold to a consortium of doctors, of which my father was one, and renamed Anonyma. And so the daughter's doctoral thesis could be printed. Finland was forced to align (but never allied) with Germany in WWII as it would have been annexed by the USSR if it had not. It fought two wars against the USSR. In the second it could not have held out without German assistance. It then ended up with a war to expel Germany from its soil. All this is controversial because the UK was one of Finland's greatest trading partners before the Second World War and promised support from both itself and the allied Forces. However, their forces were unable to make their way through the German dominated Baltic. After WWII Finland had to pay repatriations to the USSR. These included giving 10% of its land area to the USSR and having to make payments which took until 1952 to pay off. Around 400,000 Finns relocated to the remainder of Finland. The Finish president (Risto Ryti), who is a national hero for the political ducking/diving and changing allegiances that saved his country from USSR annexation, was imprisoned and although released early suffered medical problems in prison from which he never recovered. The UK role in supporting the USSR was politically expedient but does not seem to have been an honourable one. Yoldia would have been seized as part of the war repatriation if she had not been smuggled to Sweden. There was a strange symmetry surrounding the plan to bring Nirvana back home to Woodbridge, on England's east coast, in 2017. Hugh Browton and I were to travel from the site of the major discovery of the Anglo-Saxon burial ship near Woodbridge, to the site of a related discovery, that of the famous Viking Gokstadt ship near Sandefjord, 60 miles south of Oslo on Norway's east coast. A full reconstruction of the former ship is planned; a reconstruction of the latter lay a stone's throw from Nirvana's Norwegian winter berth. On top of this, the rehearsal schedule of a musical production in Woodbridge celebrating the Anglo-Saxon discovery governed arrangements for Nirvana's return, necessitating that it take place over three fortnight slots. The first two week break saw Hugh and me arriving in a sunny and abnormally warm Sandefjord all set for work. In two hours we undid what had taken several days to do, back in October 2016. The strong snow and wind proof roof over Nirvana was soon a pile of covers, rope, slats of timber, electrical extension leads, and 200 two inch screws lying on the pontoon. Nirvana had survived the winter afloat and all was well. a winter cover capable of throwing off a heavy fall of snow. 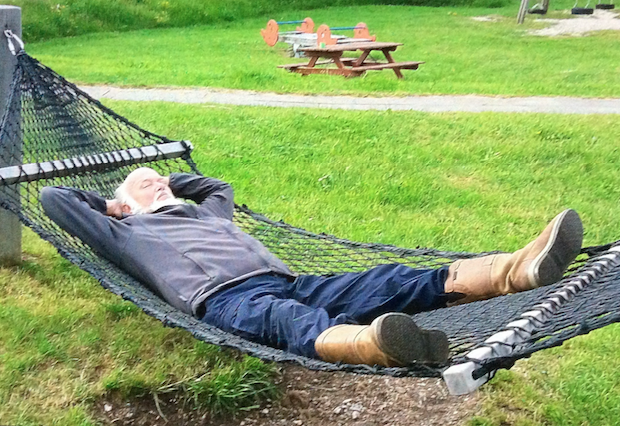 The long list of jobs diminished in the good weather which continued after Hugh's departure and permitted my sleeping aboard and working till l could find nothing more to do. Two weeks later, after the next round of rehearsals, I was flying back with neighbour Brian and fellow cast member Richard to begin the voyage home. All we needed was a wind with some component coming from the north. 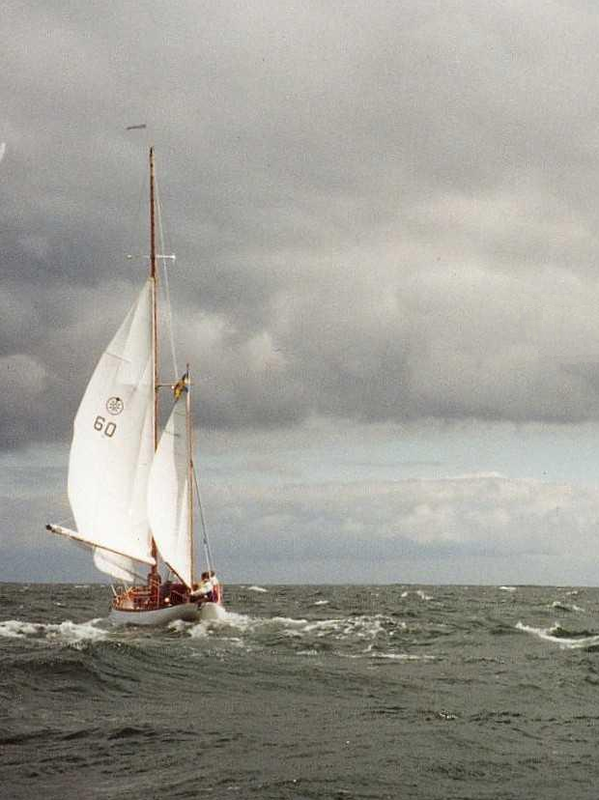 In the event we settled for the promise of a breeze from the west but the Nordic gods decided we were not to escape so easily; we fought a south-westerly, motor sailing south for 26 hours fetching up at 06:30 in Skagen, the northernmost point of Jutland. Driven out of Skagen harbour by the threat of being boxed in by an imminent regatta, loud music and much Danish beer drinking we set off south again at 10:00. Perhaps we had been condemned to be forever at sea, fighting headwinds. Thereafter motoring, motor sailing, but never just sailing, we battled both wind and current from the south until, after several hours of 2 knots progress we pulled in to the wonderfully peaceful island of Tunø, opposite Samsø. Here we spent a day restoring our souls. This lovely island has 110 inhabitants, a school with 5 pupils and the only church in Denmark that doubles as a lighthouse. Our next stop was the prettiest fjord in Denmark, the Vejle Fjord, and a flight home. We would be back in two weeks with Jamie & Tessa Clay, and our good friend Lou to try to complete the passage home: Heck, there's only the Elbe and the North Sea to contend with ! 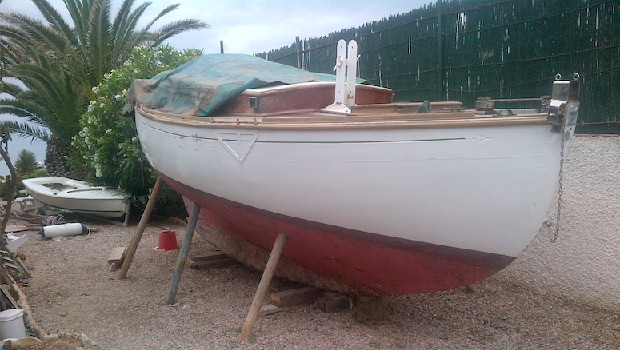 Adolfo Carlos Ceño von Stengel has sent in a collection of images of his boat Svalen, Z4 N° 44. I particularly like the picture of Svalen by his house as everything about the photograph says 'Spain'; the vegetation in the background, the sandy ground, and the reed fencing atop the white rough wall. Svalen's spent the winter in La Manga on Spain's Mediterranean coast where she's been recaulked and repainted ready for the summer. I purchased the registered ship Melissa B in May 1998 after seeing her advertised in the local paper. I found her ashore at Martin Heard's Tregatreath Yacht Yard at Mylor Creek near Falmouth (formerly Gaffers and Luggers). After giving Melissa B a cursory inspection from the outside I decided she looked sufficiently sound to not dismiss out of hand. Martin came over and joined me. After a short chat he said “Go up and have a look around”. I found a ladder and climbed aboard. She was fitted with a marinised Kubota twin cylinder diesel engine which was showing signs of age. When originally built in 1959 she was fitted with an 8 hp Stuart Turner. She was in need of work, but her lines were so pleasing to the eye that I decided she was deserving of an investment of time and money. I recall saying to Martin at the time that she looked very similar to a Harrison Butler design. He knew she was a Waterbug and built in the yard of Uphams of Brixham. From my initial inspection I decided to contact the owners and make an offer. 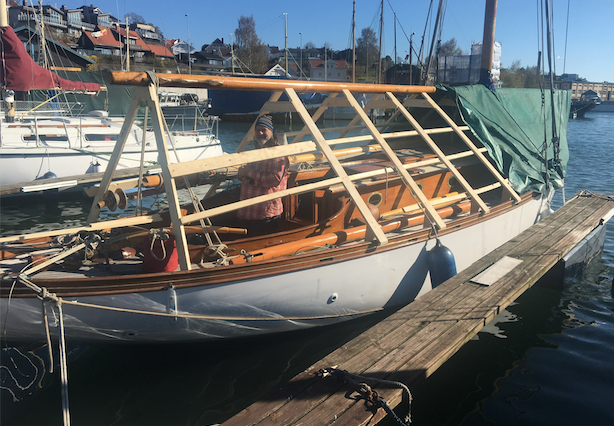 Contact with the sellers revealed that her last onshore survey had been five years ago when she was considered to be in a seaworthy condition. 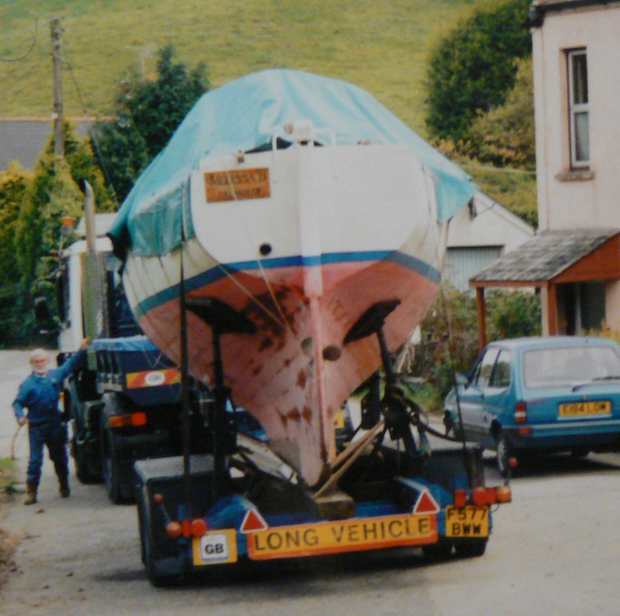 The present owners were obviously keen sailors but lacked the time to maintain her properly. There were outstanding jobs from the old survey plus a few new ones! I knew I would be taking on quite a lot of work but I needed a distraction from my day job. A deal was done and she passed into my custody together with all documents including the blue book. At some point in her life she'd suffered an onboard fire as there was evidence of some light charring on two frames, a small area of planking and sole supports in the forward bilge starboard side. She'd also had a number of plank repairs aft and repairs to both bilge stringers in the same area suggesting damage by a serious engine fire at some stage of her life. I suspect she may have been a total loss but that is only my guess from looking at the Blue Registration Book. On the 2nd November 1964 she was registered to a new owner but only until 9th December 1964. She was then owned by Belsize Boat Yard Limited at Priory Road, Southampton for just over two years until being sold in January 1967. It's possible they bought her and carried out the repairs following the engine fire as an in between jobs filler. I'd be most interested if any readers can throw light on this. Apart from attending to the defects listed in the survey there were several other parts of the vessel now requiring attention if she was to look pristine. 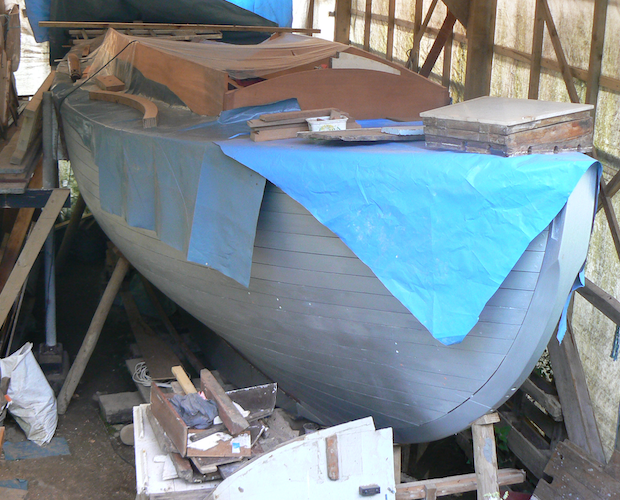 Initially, work commenced on her at the boatyard where I had intended to carry out most of the repairs. However, one day whilst working on her the heavens opened up. I went below to seek shelter. Water was steadily dripping onto one of the berths in the saloon. I made the decision there and then that Melissa B would have to come home. Since getting Melissa B home I have replaced 57 of the 68 steam bent oak frames and completely refastened her. I have fitted new bilge stringers each side, new carlings, shelves and both half and full beams throughout and a new marine ply deck. About twenty or so new full length Scottish larch planks (courtesy of a 26ft tree I bought from Cromarty Timber) have also been fitted. Also renewed was the top half of the mahogany transom which is 2 inches thick, a new English oak forefoot and the upper part of the stem and apron which I constructed of laminated oak. I removed the 18 inch wide (at its widest point) cast iron ballast keel and had this shot blasted in the boat shed I constructed around her. I refitted this ballast keel with a new white lead and felt gasket and new keel bolts throughout. While the ballast keel was off I renewed the bolts for the strap floors. Melissa B was originally fitted with 4 genuine wrought iron strap floors and 2 deep wooden floors. The iron floors were copper fastened leading to the inevitable delignification of the wood in the vicinity of the fastenings. All affected planks were replaced. I then made up new laminated oak floors with up to 15 laminations in each and added 3 additional floors up forward making seven strap type floors altogether. Both wooden deep floors were replaced as well. I renewed both coach roof sides using African mahogany, each plank being 20 inches wide, 16 ft long. I bought this timber new from W.L. West & Son, Petworth, Surrey soon after buying the boat. It would be difficult and perhaps impossible to buy such wood in this country today as this species is now on the IUCN Red list as an endangered and vulnerable species. I have kept to the original internal layout. I have, however, redesigned the galley so that there is a fitted sink and a Taylor's paraffin stove. Previously there was a two burner gas hob and no sink at all. I've also added a pressurised cold water and filtered drinking water system. Once finished, there will be a new sole throughout, which is nearly complete. I have made this from American walnut and local holly strips bonded using epoxy onto high quality marine plywood. The heads was originally fitted with a Simpson Lawrence unit. Unfortunately the ferrous pump casting was cracked and not easily repairable. I found a second hand Baby Blake and renovated it completely for about £400. This included the cost of a new set of genuine seals, as well has having the unit resprayed and re-chromed. This was quite a bargain, for new would cost in excess of £4000. I have installed new coach roof beams which I made from locally sourced sweet chestnut and ash. The originals were solid ash and could have been re-used had it not been for the Track Mark failing around the edges of the coach roof. The furniture below decks is all new, hand oiled finished. 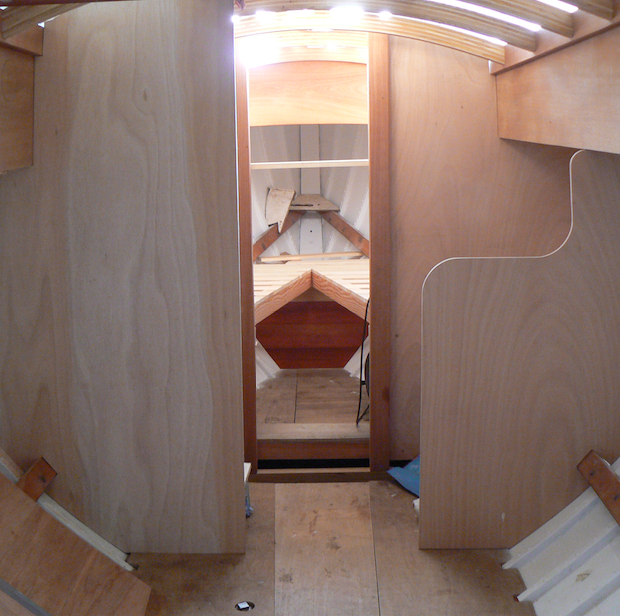 I am currently working on the saloon berths. The plan once these are done is to install the new Nanni diesel engine, even if temporarily, and construct a new bridge deck. The old bridge deck had seen better days, was showing signs of rot and quite frankly was not worth repairing. It will then be onto the cockpit area, not forgetting to put on a new coach roof. May 2019 will be the twenty-first anniversary of my purchasing Melissa B and is a 'sort of' target for completing what has turned out to be a major restoration. 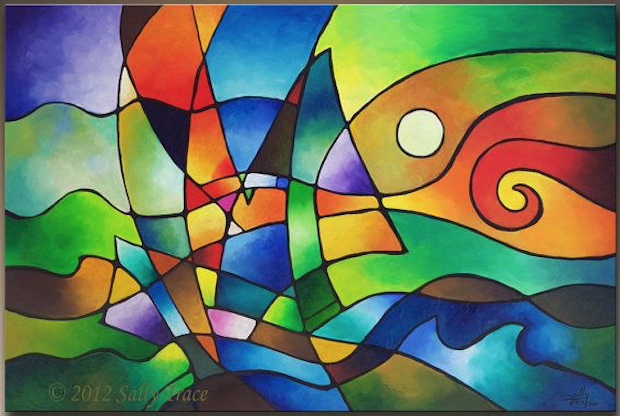 Sally Trace is a present day abstract artist living in Pennsylvania, USA. Her work is characterised by bright vibrant colours, and she's been exploring a geometrical, stained glass theme for several years. This is her only sailing and sea composition to date, from 2012, called “Into The Wind”. The photograph is an embroidered design representing our Harrison Butler derived Veritia, built to the Uphams Waterbug design. All the crew (my wife and I) are suitably attired for the coming season. It is programming the computer with the embroidery instructions that is costly. Now that this is done and on file, it is relatively simple to add the design to further items of clothing. I wondered if any other Waterbug owners, or those with the similar Zyklon design boats, would like clothing similarly adorned. If so, do get in touch. My contact details are in the HBA Year Book 2017. James Young and his crew's embroidered clothing. Our boats for sale section is being expanded to include vessels designed by Albert Strange, David Hillyard and Alan Buchanan. 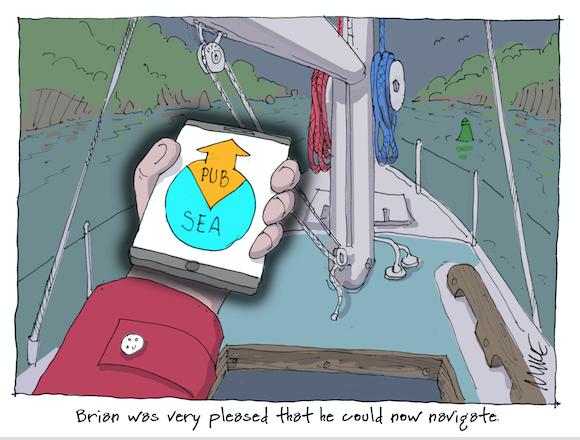 This is part of an ongoing project to develop links with other like minded sailors and their Owner Associations. 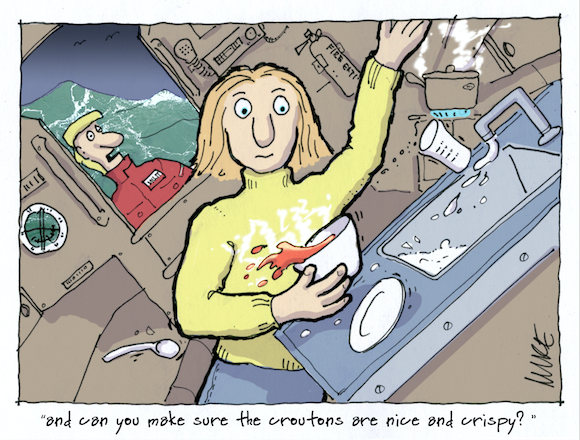 Mike Mockford is a freelance cartoonist living in Teignmouth, Devon. His cartoons frequently appear in Practical Boat Owner. An impressive collection is presented on his website including these that I hope will make you want to see more. fully formed articles, rough notes or snippets of News.